International conference organized by Columbia University and École des hautes études en sciences sociales. Supported by the Agence nationale de la recherche (project ChinaSpheres), PSL University, Weatherhead East Asia Institute, Columbia University. Since the “public sphere” framework first became an object of inquiry in China studies in the 1990s, its limitations and biases have been criticized and discussed on many occasions. They include the difficulty of drawing a clear line between public and private (and the conflictuality inherent in disputing this border) and an overly idealized vision of “rationality” which disqualifies emotions or “uncivil” discourse. At the same time, publicness as a characteristic of a specific set of social practices cannot easily be reduced to another framework. Publications, the circulation of normative preferences and ideas, social emotions, the formation of critical publics, never ceased to play an important role throughout China’s 20th and 21st-century history, including during times of political repression. Why do groups of people work together to publicize their ideas in newspapers, websites, or wall posters despite the risks often involved? Conversely, why do disputes over normative or political preferences play out in public venues and discourses rather than in private? While recent developments around the world suggest that too much confidence has been placed in the rationality of the public sphere, critical engagement with the formation of public opinion and the dialectics of emotions and ideas in the context of global capitalism seems more topical than ever. For these reasons, we plan to revisit the notion of publicness at different points in 20th and 21st century China, based on the study of publicly disseminated texts (in the broadest sense), the institutional vectors that allow them to circulate, and the publics or discursive communities associated with them. We plan to raise some of the following questions: How did discussions of intellectual and political issues become public and filter through society in China’s changing political contexts? How did the venues for dissemination of critical discourse and formation of public opinion vary in different institutional contexts and media forms? How did private economic interests contribute to disseminating such debates? How do discourses circulate between different media and different levels or scales of publicness, for example from unofficial to official publications, or from extraterritorial (sometimes global) to national or local settings (or vice-versa)? 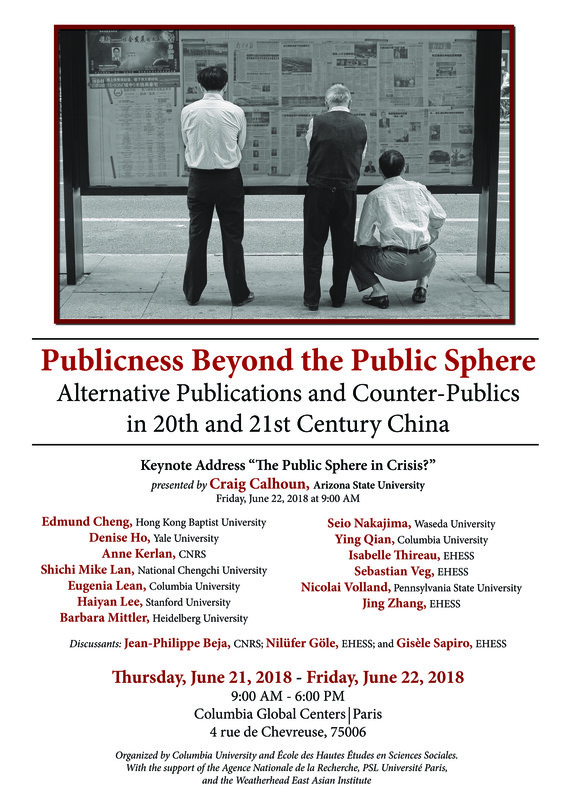 Publicness will be examined a variety of empirical configurations: historical (Republican era, Mao era, contemporary China), geographical (Mainland China, Hong Kong, Taiwan), political (democratic, authoritarian, colonial), and medial (print, cinema, internet). We also pay attention to linguistic and ethnic differences and translation to examine how publicness is formed in multi- or translinguistic settings, such as Tibet. Comparisons between these cases may challenge assumptions about the respective roles of critical discourse, emotions and norms in each context. Publicness as a dimension of social interaction and practice, challenged sometimes by the state, sometimes by the market, is rarely a given; rather it appears as the result of discursive (sometimes contentious) strategies by individuals or groups; it is not a tool but often a goal in itself. We will bring together different disciplinary perspectives ranging from humanities and media studies to intellectual and social history, sociology and political science. Papers may present empirical research on specific cases or more synthetic assessments of theoretical issues of publicness, or a combination of both.